This post is brought to you by Foodie.com. Summer time, to me, is all about getting into your backyard with a group of friends. Even when Phoenix weather hits 120°, there is still this desire to head out doors in the evenings with friends and enjoy the slower laid back feel that comes with summertime. I love when you get outdoors, fire up the grill, pull out the paper plates and load them full of good food, and then spend the evening chatting under the stars. Those are some of the most fun memories I have with our friends. Our parties always center around food! Here are some great grilling recipes to try this summer as you head outdoors. A grilling menu, to me, usually includes a super yummy meat like hot dogs, pulled pork, or ribs. But a meal is never complete without some amazing side dishes to help overload the plate. Pasta and potato salads are usually a must as are fruits and veggies to round out your meal. To cool off this summer, when the meal is over, try a new recipe! I was inspired by my boys love of root beer floats to create a smoothie float and it was a huge hit! 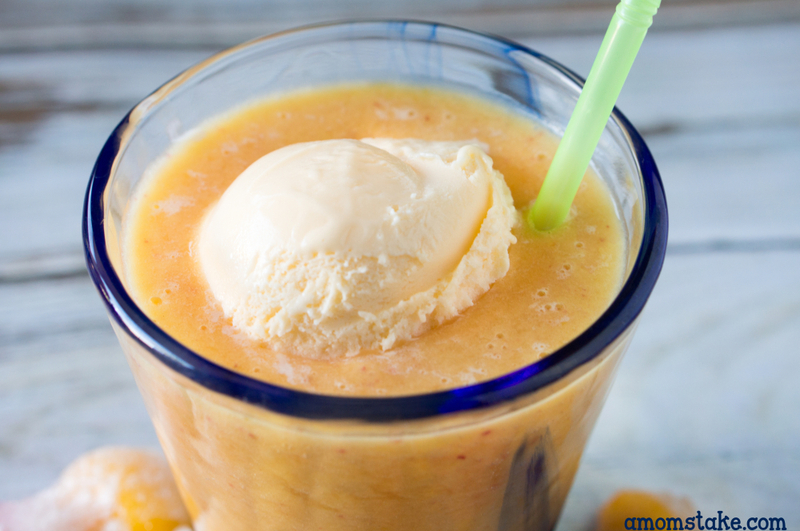 We call it an Orange Smoothie Float! Best of all, you just need 3 ingredients and it’s super tasty! It felt like a whole new kind of drink as the ice cream started to melt giving a creamy cool treat. 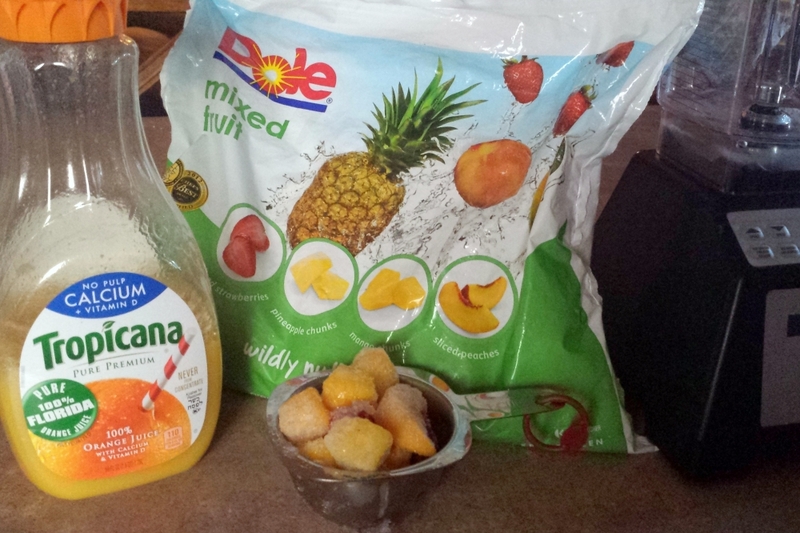 Blend together one cup of frozen tropical fruit mix with one cup of orange juice. Each mixture will fill a 6-8 ounce cup, so just double or triple the recipe as needed for how many servings you want to make. Variation: You can make the smoothie a bit thicker by using 1/2 a cup of orange juice which will make it a more traditional smoothie consistency. Or, use the full cup of orange juice for a thinner smoothie that’s closer to an Orange Julius consistency. Either way tastes great, it’s a matter of preference or supplies on hand. The one I made with 1/2 a cup of orange juice was perfect for eating with a spoon, if you’re the type that likes to scoop up the ice cream in a root beer float. 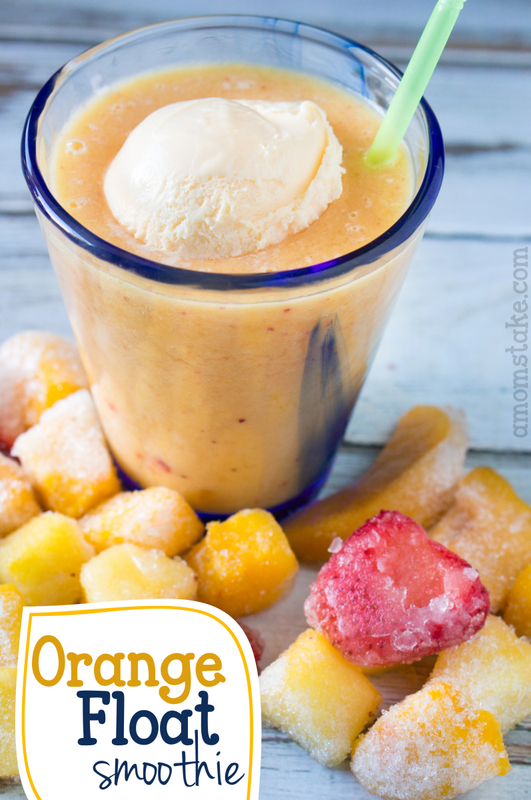 The 1 cup of orange juice version I made was more of a drinkable consistency, though the ice cream still kept to the top of the float. You can easily use a straw to mix and enjoy the ice cream with the smoothie. Top off your smoothie with a scoop of vanilla ice cream on top and enjoy! What’s your favorite recipe to add to your grilling menu?